A Patriots fan walks into a Delco coffee shop before Super Bowl LII. The next couple of days are going to be a tsunami of trash talk between the people of Philadelphia and the people of New England. There's really no better way to gear up for a game as monumental as Super Bowl LII. All week, Philly and Boston have been boycotting each other's products and disparaging each other's identities in ways only an NFL rivalry can inspire. The Museum of the American Revolution switched their Patriots Gallery to Eagles Gallery. A Boston bakery banned Philadelphia cream cheese, even though it's not made in Philly. Dottie's Donuts won't sell you a Boston Creme. Some fool put a Brady jersey on the Rocky statue. The list goes on and on. It might be hard to top the joke played on a Patriots fan who had the nerve this week to walk into a Delaware County coffee shop looking like baby Bill Belichick. 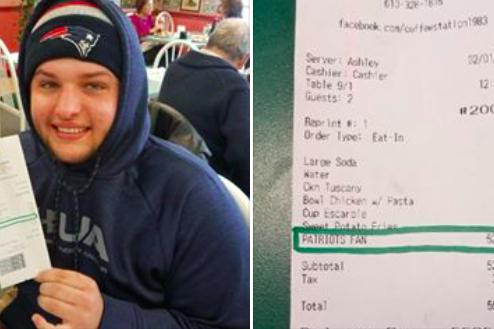 On Thursday, The Coffee Station in Morton posted a photo of the fan and the bill he was given for patronizing the place in such offensive attire. So let's see, with the $5,200 Patriots fan charge, that'll come to ... $5,535.06! And if you're feeling tread upon by $313.31 in tax, you can empty your tears into the Boston Harbor. The Coffee Station didn't stop there, according to NBC10. Owners John and Barb Paciotti had the whole restaurant sing the Eagles fight song in the Patriots fan's face. He'll be welcome back for a free lunch Monday if he's willing to wear Eagles attire. Everyone else can enjoy a 15 percent discount on their bill for wearing Eagles gear through Sunday.